Board games spread disease! Plague Inc: The Board Game has infected Kickstarter today with a $34,000 goal, and has already raised 30% of that in the first hour! 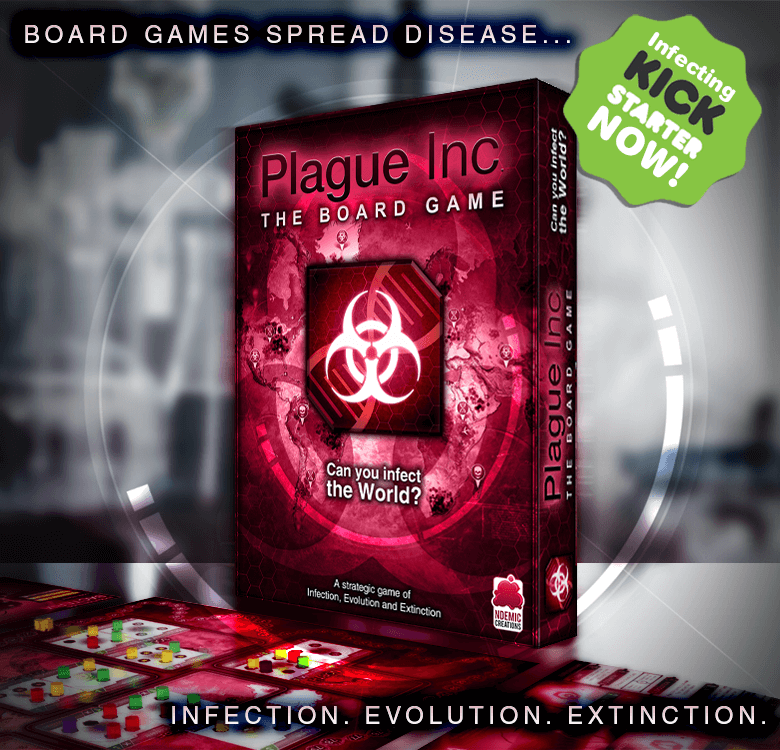 In this strategic board game, 2-5 players evolve deadly plagues and battle to be first to wipe out humanity! ​Make sure you back it now and help us infect the world! Based on ‘Plague Inc.’ with over 70 million players worldwide, Plague Inc: The Board Game combines the best bits of the original game with a unique tabletop design. The result is a game with a realistic theme and engaging gameplay which can be enjoyed by anyone who likes the idea of infecting people with the plague! The game has been in development for almost 2 years and is fun, polished and has been extensively tested, with funding now required to get the game manufactured. In addition to receiving a discounted copy of the game, all pledgers backing the game via Kickstarter will receive a Kickstarter-exclusive ‘Patient Zero’ pack, featuring exclusive, mildly humorous crowd-funding themed content such as the ‘Repetitive Strain Injury’ trait card and the ‘Crowd Funded Soap’ Event Card. Further pledge tiers include the option to add 5th player expansion pack, a digital content bundle, and Collector’s Edition packaging - so there’s plenty of opportunity to be as infectious as you like! The Kickstarter lasts 21 days until 31st May, and backers will receive the game November this year, well in time for the holiday season. Plague Inc. submitted to Apple!